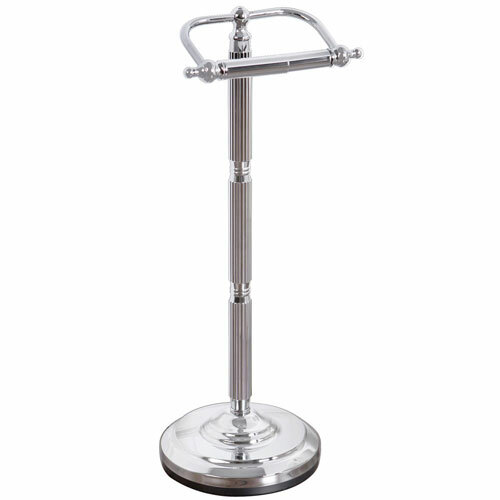 Kingston Brass Chrome Georgian pedestal free standing toilet paper holder CC2101: This Georgian Pedestal Paper Holder is built to last. The highest quality standards are used to precision manufacturer a top of the line product. Important features of this BRAND NEW Fixture: Complete Item! Everything necessary for installation is included. Matching Accessories Available - Easy to Install - Installation instructions included - Georgian pedestal free standing toilet paper holder - High Quality Aluminum/Brass Construction - 21-1/2-inch Total Height - 7-1/2-inch Base Diameter - For vintage styling and design for a lifetime of durable performance. Premium material construction and an extensive selection of scratch-, corrosion- and tarnish-resistant color finishes offer durability and years of beauty. - Chrome premier finish designed to resist fading and tarnishing. This fixture is manufactured by Kingston Brass and is part of their Georgian collection. gorgeous piece of hardware. Will do business with these folks again.